Are Stormvermin any good ? Last two of Stormvermin regiment are finally painted! This kind of thinking and dilemma I had when I was painting last piece of my Skaven Stormvermin regiment for my little 1250 points army. These last two Skavens were the last. 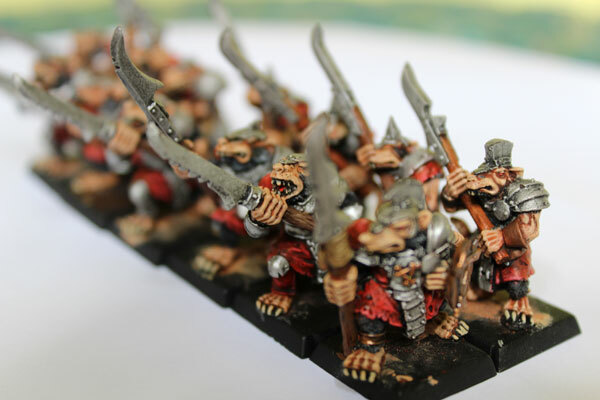 It includes 25 troops – full Stormvermin command group: standard bearer, drummer and champion. All miniatures are metal Stormvermin from 5th Edition Warhammer Fantasy Battle – all except three – these are metals from 6th edition. Eventually I will add more Stormvermin to the unit, and I will exchange 6th edition minis for those from 5th edition. For now I will use this 25 troops strong regiment as elite choice or my little battalion. It might look like this is not especially huge number of Stormvermin here. I agree – Skaven strength is always in number. I used to build Skaven armies, remembering the rule. Back in the late 1990s my Stormvermin unit size was usually 50 and plus. This time though – I want that my little Skaven force won’t have that huge regiments. I will not deploy regiment bigger than 30 models. 30 minis in the regiment – block of 5×6 – it looks really good. I can’t stand the look of those numerous units, with 5 soldiers in front rank and never-ending ranks, just to get the highest possible bonus in combat. Such long units are not appealing to my feel of aesthetics. And no to mention – limited manoeuvring ability in the heat of battle. So, in conclusion – 30 minis in the regiment is enough for me. My army won’t be especially competitive, but will look absolutely awesome. 13 of my Stormvermin in their glory! Half of my Stormvermin are in Poland right now – as soon as I reunite with them in May 2015, I’ll post some pictures. Right now I have 13 of them. They have red clothes (Evil Suns Scarlet), black fur (as Stormvermin Fur equivalent, I used Abaddon Black with Mechanicus Standard Grey for highlights. I don’t like Stormvermin Fur Paint – my Stormvermin have more black fur – they look much better with black.) Armour is kind of silver/metal (I used Runefang Steel – with Nuln Oil Ink -so it looks like old not very often polished metal. Some pieces of armour are red like the clothing. In the 1990s, I used to paint the armour of Stormvermin all red, so those pieces are kind of the little tribute to old days and old army. Bases are not painted, I have an idea what Skaven bases use for them. I explained it in one of my previous posts. Back to the title question. Are Stormvermin in the army the good idea? As you can see – I will use them. 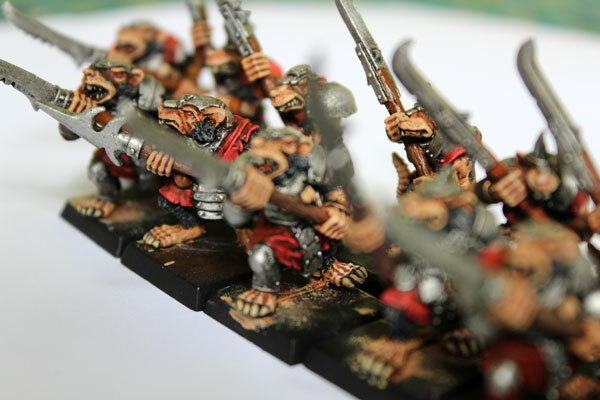 Even though, my army is really small – 1250 point – Stormvermin regiment is one of my core choices. This choice though is made entirely by heart. 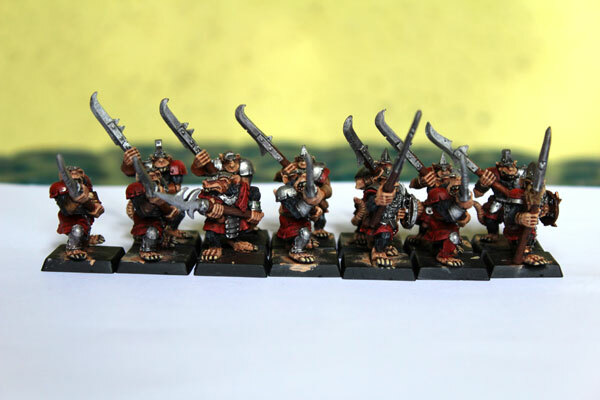 They’re are my favourite troops in whole Skaven army selection. 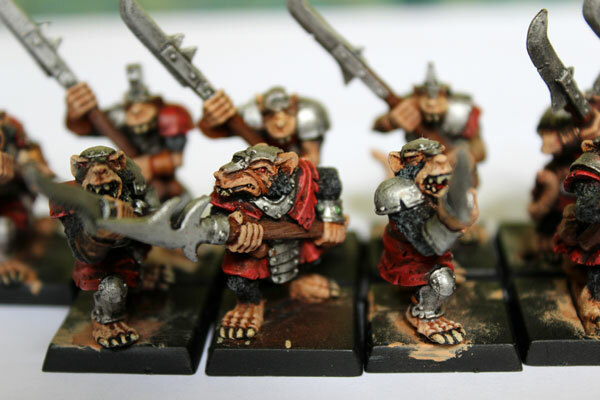 I used them before and I will use them in the future – fingers crossed, that Games Workshop won’t mess up too much with rules for 9th Edition, and Stormvermin will still have their place in Skaven Army Book. Hopefully, there is only slight chance that GW will not include Stormvermin in army choices. Anyway – Stormvermin look cool and this is main reason I deploy them almost every time. Period. But what about the rules? Are they have any major advantages that you should use them instead Clanrats as the core selection? They are rather expensive troop choice comparing to Clanrats. Stormvermin cost 7 points (Clanrat with shield -4.5 points). Higher Weapon Skills (4), and more Strentgh (4). Armour Save – 5+ just like Clanrats with shields (so Clanrats will get the ability to Parry). They also can be accompanied by Weapon Team but unlike Clanrats they can have Magic Banner. So we get slightly better warrior for 2.5 points more – I don’t think it’s a good business. It’s better to spend those points for more Clanrats, than use expensive Stormvermin. Even though they can get magic banner. For competitive games, Clanrats have definitely more use. That’s all about Stormvermin. I will not paint them any time soon. 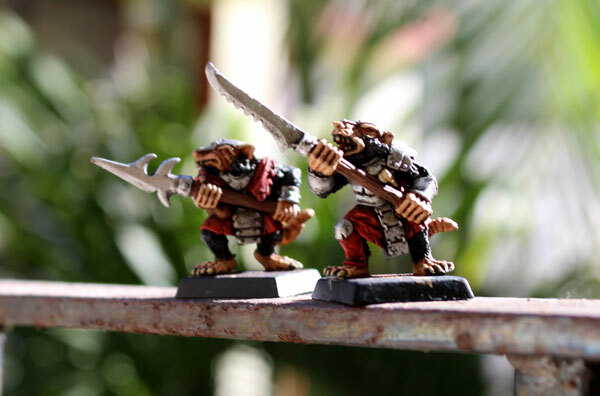 My plans for upcoming weeks are to paint few Clanrats and Slaves at first. I would love to paint Grey Seer from End Times first, but I also need to paint those common rats. So I postponed a little bit my Grey Seer, but he will be next one for sure (I can’t wait!). I have 8 weeks left here in Mexico and finally enough minis to paint during this time. I also will be visiting few nice places here. It’s going too be awesome! The highlights on the feet and eyes especially look ace. Great job. Previous PostFinally! Warhammer Shop (in Mexico). Next PostI’m affraid, Skaven Slaves are essential.